Microgravity (Astronauts on the International Space Station are orbiting the earth in free fall  the space station, the astronauts and everything on board are all "falling" around the earth at the same rate. This creates the floating sensation we think of as zero gravity, or more correctly, microgravity) provides an environment that lacks buoyant convection, which normally plays an important role in maintaining and shaping a flame on earth. In earth’s gravity, buoyant convection develops when hot, less dense combustion products rise. The flow that results draws cooler surrounding air to the base of the flame, supplying it with the oxidizer that the flame requires to maintain itself. Combustion products are carried away from the flame by the same convective flow, which is the dominant transport mechanism in the flame.In microgravity, however, the process is not the same. There is no buoyant convection, and the transport of combustion products and oxygen occurs by the much slower process of molecular diffusion. This diffusion occurs when there is a high concentration of combustion products and a low concentration of oxygen close to the flame and a high concentration of oxygen farther away from the flame. The combustion products migrate away from the flame and the oxygen migrates toward the flame. The diffusive transport rates in microgravity are much lower than the transport rates due to natural convection in earth’s gravity. 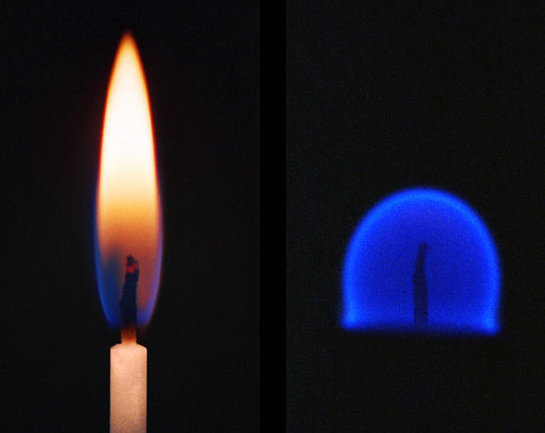 As a result, a flame in microgravity will often appear to burn less vigorously than a flame on Earth, and it will assume a spherical shape that diffuses equally in all directions, rather than the more elongated shape that is characteristic of flames in earth’s gravity.